If you ride in Deer canyon, you have probably seen the closure signs recently added. Fear not, this is only temporary and, actually, great news for legal trails. It is a short term closure through January 2019. Heavy equipment is being brought in to strip the valley of invasive plants. The canyons will be rehabilitated by introducing native plants. The trail is being permanently rerouted on the south side of the canyon, to the west side of the lake, during this process. Here is some background on this project and how it will eventually lead to legal trails in this area. In 2017 the property known as the Barzceski parcel became available for purchase upon the passing of the current owner. The property is bordered by open space to the east, west, and south, including Del Mar Mesa, Penasquitos, and Pardee land that will be granted to the city of San Diego shortly. Multiple parties were interested in the land, including developers, private parties, and various public agencies. The property has long held interest to the San Diego Mountain Biking Association (SDMBA) as a viable loop solution to connect the Del Mar Mesa Switchback trail to the Tunnels trail complex via single track along Deer lake in the middle of the property. In early 2018 SanDag (San Diego Association of Governments) purchased the property for mitigation value. This ensured this remaining open space would remain untouched by developers. 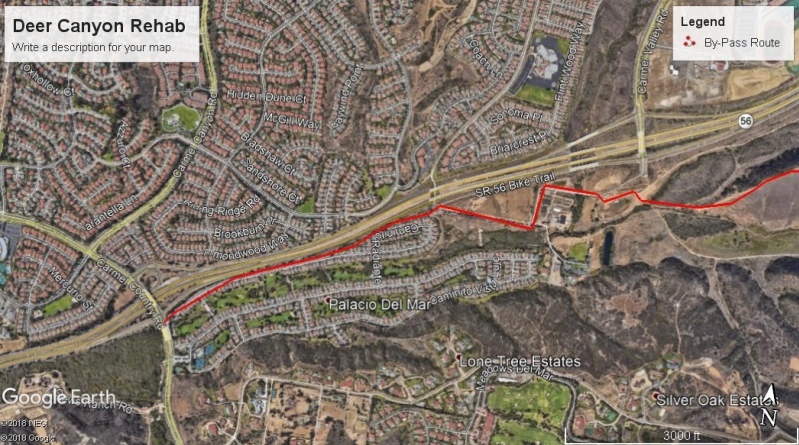 Working in conjunction with the city rangers of Los Penasquitos Canyon Preserve, SDMBA is proud to announce the approval of a legal loop connecting two existing trail heads. However, there is some work to be completed first prior to the opening of the trail. The mitigation that SanDag is committed to will be the complete rehabilitation of the farmed land below the lake. The total acreage is approximately 5 acres and extends from Deer lake on the property west to the previous Pardee mitigation site (there is a large dirt berm currently) south of the adjoining canyon where the Switchback trail enters the valley. During the initial mitigation process, all access will be denied to the valley. Two major trail heads and one minor will be temporarily severed in the process. While it is inconvenient in the short term, the end game is permanent, legal trail that will create a urgently needed loop to help alleviate traffic within the current system. As a partner with the Rangers, SDMBA will be improving the existing trail directly west of the lake, rerouting the section that is precariously located along the edge of a perennial stream and move it approximately 6 feet south, out of harm's way. For those wanting to use the trails please review the maps below. During the restoration/mitigation grading process, travel will not be allowed, per SanDag, in the red shaded areas. The red trail is an alternative line that will allow for travel around the impacted area. 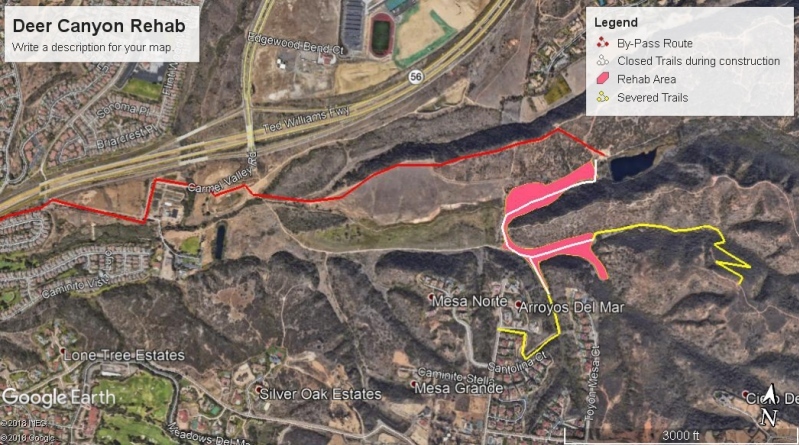 It will allow users to travel over to Camel Creek road and utilize the trails leading up to the Carmel Mountain Preserve and descend into Los Penasquitos by the Wagon Wheel Crossing. Please abide by the closures. SDMBA will continue to post updates on the progress and projected timelines as they are announced. Through the late 90's Deer Canyon was a thriving migrant worker camp providing most of the labor used to build the homes in the area. There was a population numbering into the hundreds, complete with a church and small stores. Overtime the population moved out but the trails and pollution remained. The trails known as the Intestines were destroyed as houses were built in the area and the displaced riders discovered the area. It was an area not governed by any agency and a wild west mentality ensued. The land was purchased as mitigation land in the mid 2000's and was slated to be an exclusively no human activity preserve. Word quickly spread among the community and riders banded together to fight the pending closure. The fight was lengthy, complicated, and took a lot of resourceful people to work on it continuously. The main oversight was through the Los Penasquitos Canyon Preserve Citizens Advisory Committee (CAC), a group of community representatives who were mostly very hostile towards biking in the preserve. It took a six year effort to begin to change that tide. It also took years of direct communication with the City of San Diego and regulatory agencies. The first maps from the city only had the main SDGE service road. All of the trails were mapped and presented to the city much to their embarrassment. They believed the area was a pristine habitat. Riders wanted to work with the city to preserve the existing trail network. A user organized cleanup day was completed, removing 3 full dumpsters of migrant trash dating back through the years, as a show of good faith. The effort did little to sway the opinions of the city at that time. The city began to relent and was willing to look at proposals. Realizing not all trails could be kept, SDMBA created a proposal that would preserve 60 to 70 percent of the trail, allowing traffic flow to maximize use and minimize rider conflict. The city came back with a plan that was little better than their original effort. After much back and forth, the finalized plan was a marginal plan that was dependent upon future trails to complete the transaction flows on later dates. The plan closed several popular trails because the crossed private property, wildlife agency land, or designated protected habitat. Even after a plan was finalized on paper around 2012, it still took over four years of environmental studies, agency meetings, and city council votes to get it to July 2016. It was on this date that the legal Del Mar Mesa trail plan was opened to the hiking and biking community.